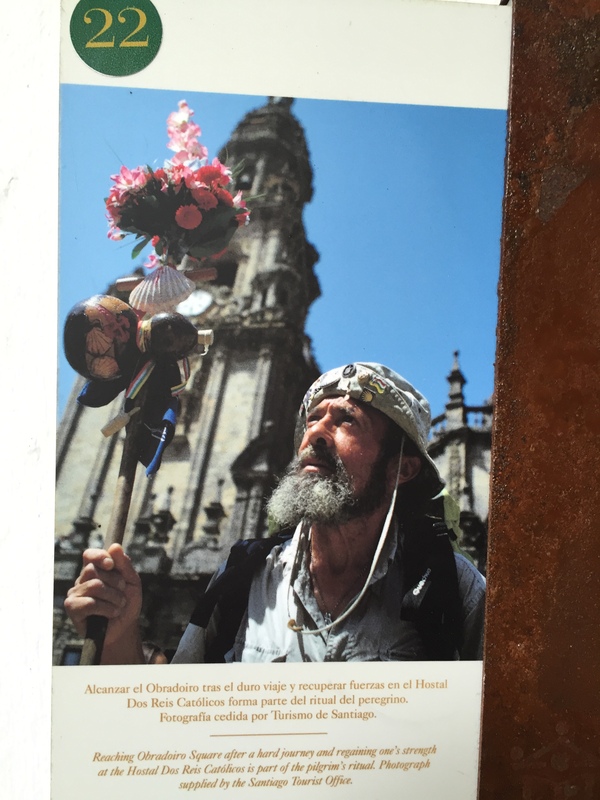 Continued from Santiago Highlights: Free Walking Tour and Secretos de Galicia. I have a thing for Paradores, a network of luxury hotels in Spain, usually located in a converted historic building such as a monastery or castle. My husband and I first discovered Paradores in 2007 when we spent a month in Andalucia, in Southern Spain. 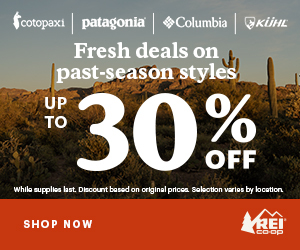 It was winter, and we took advantage of their lower rates and a special Amigos offer of the fifth night free. This allowed us to stay in Paradores in Málaga, Ronda, Nerja, Cádiz, and Granada for surprisingly reasonable rates. In 2014 my mom and I stayed at a Parador in Santo Domingo de la Calzada on a tour of Northern Spain for our annual mother-daughter trip. Paradores are all unique and have different degrees of luxury, but every Parador I have visited, even if just for a coffee break, had an understated elegance and historical significance. 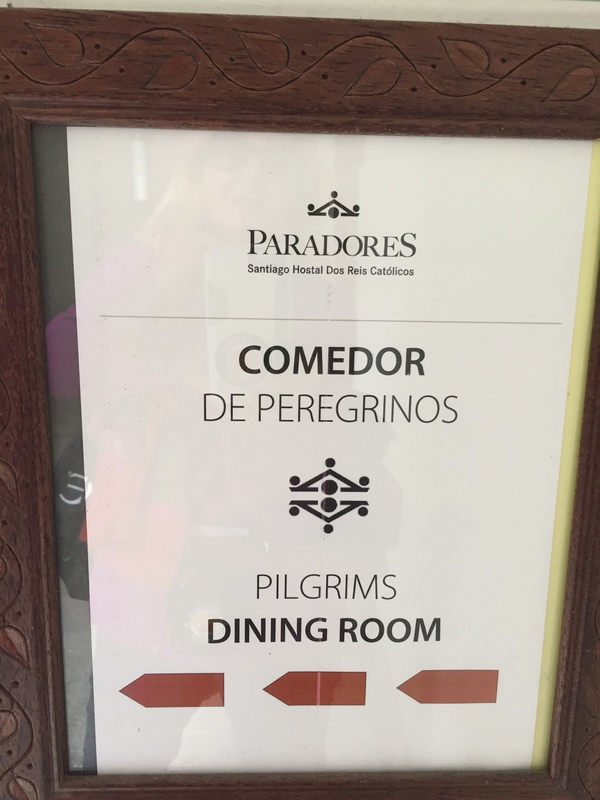 Needless to say, when I heard that Paradores offer pilgrim rates for rooms and meals, I was excited! 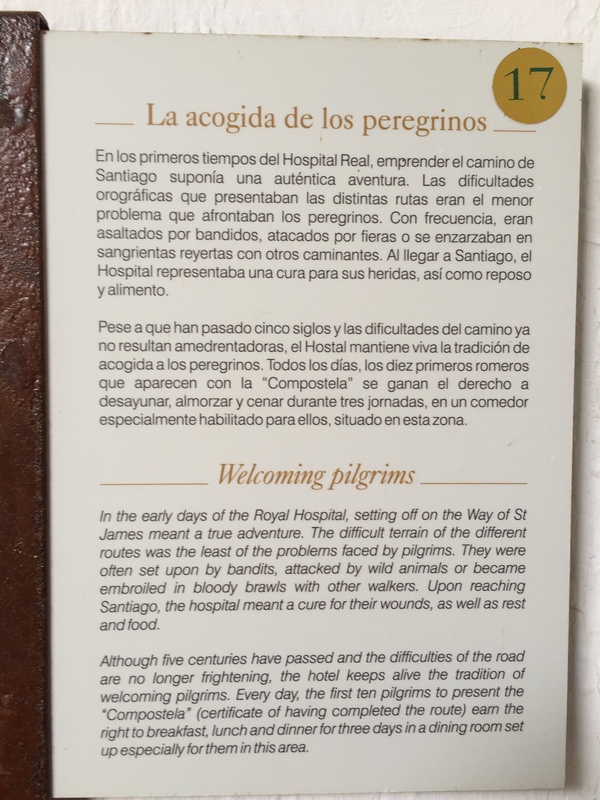 There are many Paradores along the different Camino routes, and, whether or not you stay the night in one of them, it’s worth checking to see if they offer a pilgrim menu for lunch or dinner. 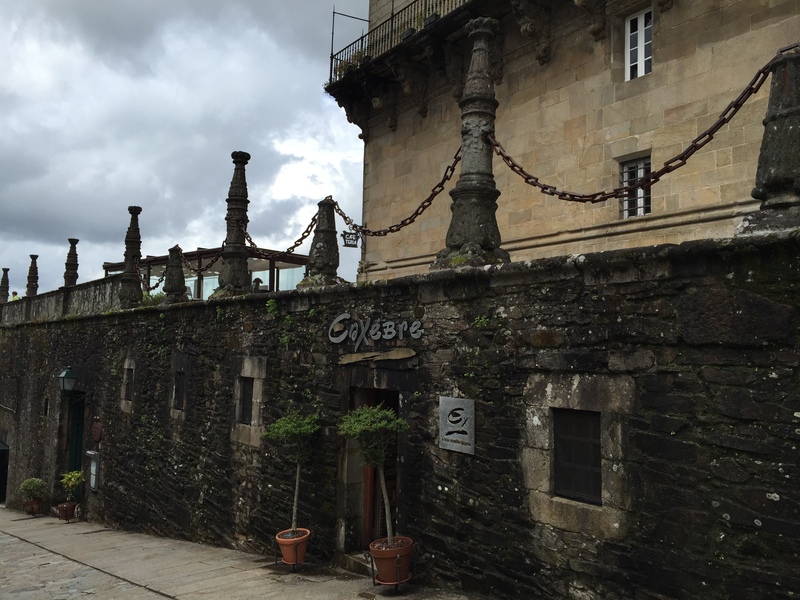 On my recent Camino Portugués, I had a pilgrim dinner at the Parador in Tui and Pontevedra. They didn’t have a pilgrim menu for the fancy dining room at Pontevedra, but I enjoyed an order of pulpo at the bar, which was full of jovial peregrinas! 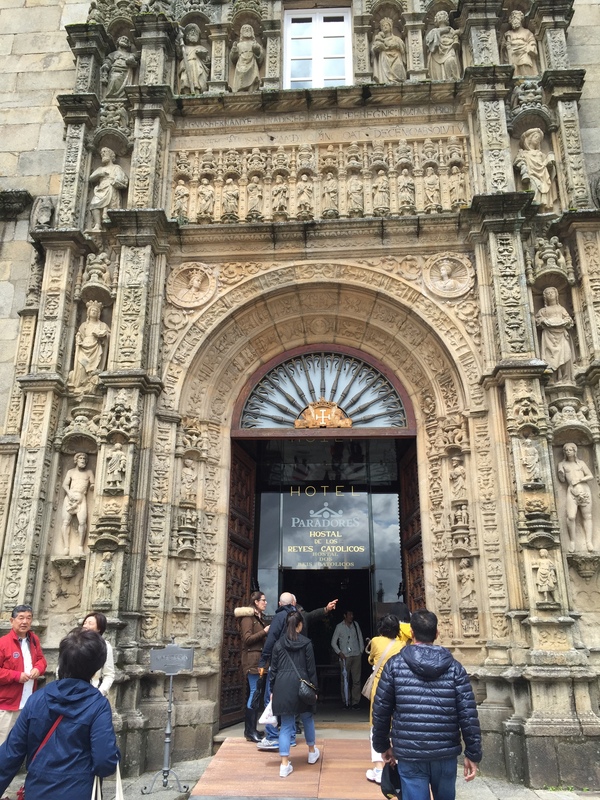 Below is my account of the pilgrim lunch at the Santiago Parador. The entrance to the Enxebre restaurant at the Parador in Santiago. 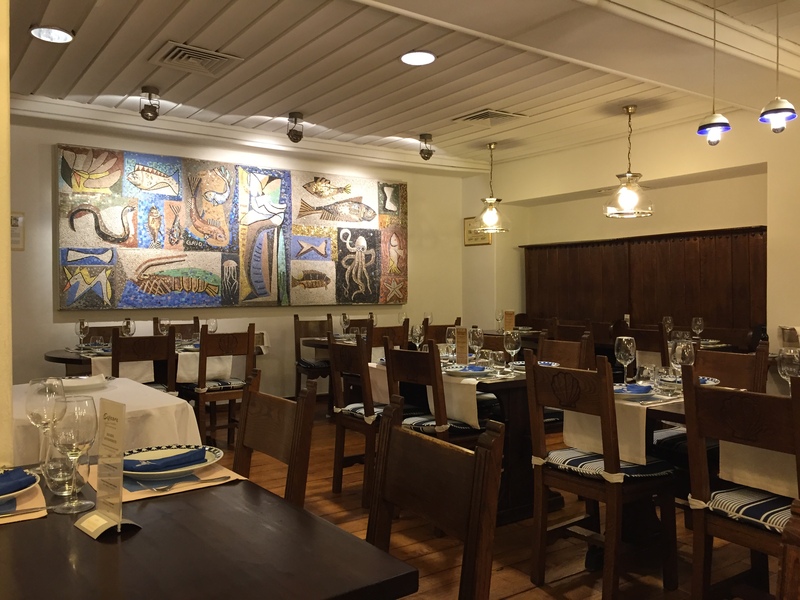 On my second day in Santiago, I decided to treat myself to lunch at the Enxebre (Galician for authentic or typical) restaurant in the Parador Hostal Dos Reis Católicos. Of the two restaurants, this is the more casual, but absolutely gorgeous inside! 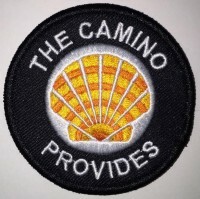 And of course, being in Santiago, there are Camino shell symbols throughout the dining room. The pilgrim meal cost eighteen euros (approximately 20 dollars) and consisted of cream of asparagus soup, Paella with mussels and shrimp, and Tarta de Santiago for dessert. I enjoyed this lunch with a couple of glasses of Albariño wine, a Galician white wine that pairs well with seafood. Delicious and generous portion of Paella. Below are a few photos of my dining experience. Notice the scallop shell design carved into the back of the chairs, and embroidered on the napkins and place mats. Hours for lunch and dinner. After lunch I wandered around the grounds of the Parador and took more photos. The Santiago Parador offers a special free meals for pilgrims! See details below. I haven’t tried it, but I’m very curious to try this next time I’m in Santiago. If you have any tips about doing this, please use the comment section below or email me. If Santiago marks the end of the Way of St. James for you, you might be interested to know that you can enjoy a free meal at this luxury hotel. According to a tradition dating from the time when the Royal Hospital became a hotel, the first ten pilgrims who cross the threshold of the Parador each day are given a free lunch (served in the Parador’s staff dining room). Visit page. 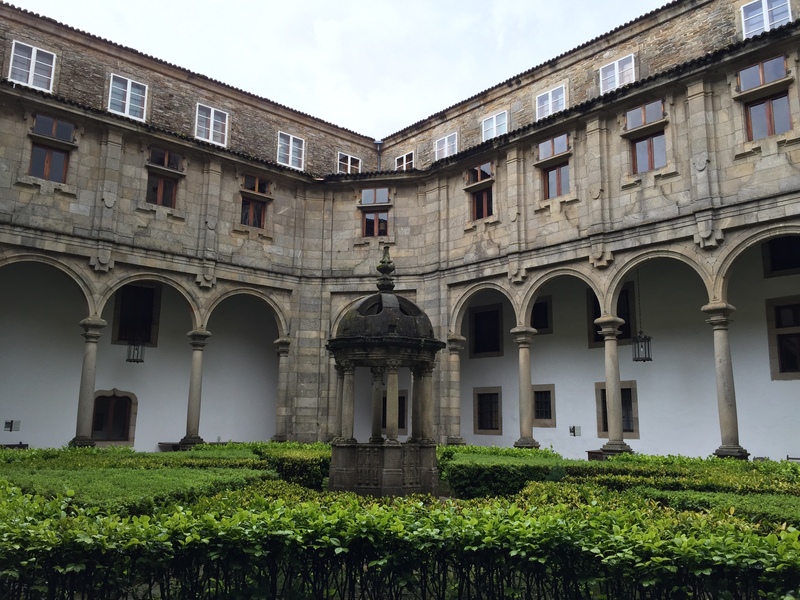 I could not get a pilgrim rate at the Santiago Parador in May 2016, but I am planning ahead to stay a night there for my next Camino in 2017, in addition to staying at the Hospederia San Martin Pinario for a couple nights. I dream of staying in all of the Paradores at some point in my life. Six down, eighty-five to go! 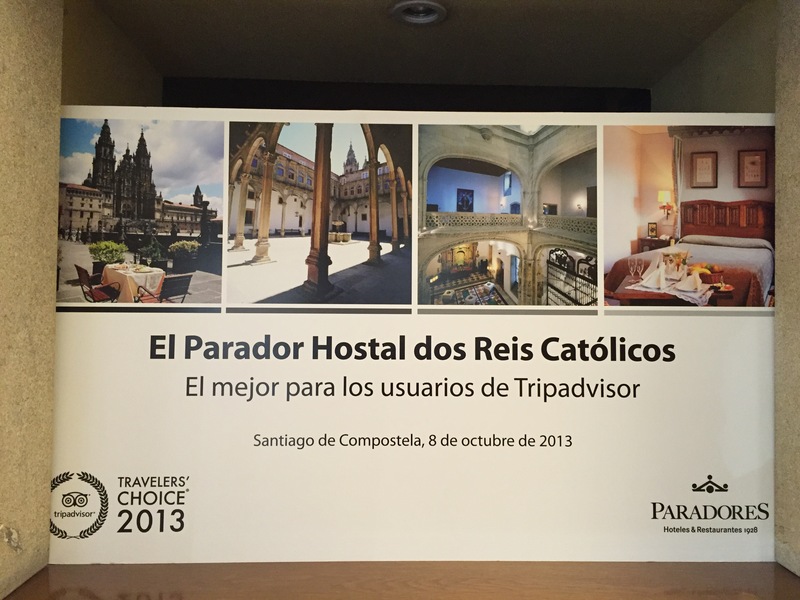 According to this page, there are more than ninety Paradores. If someone has a complete list and accurate number of Paradores, please comment below, or email me. Gracias! 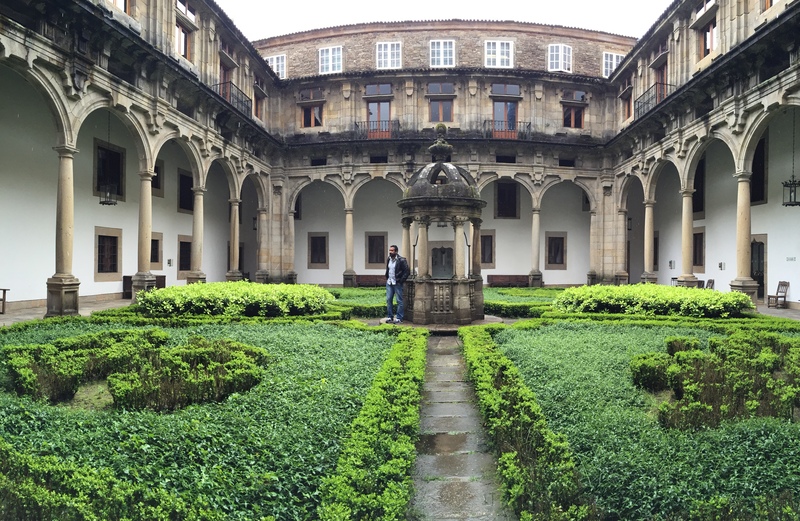 Up next, Santiago Highlights: Plaza del Obradoiro. Their Twitter account @paradores might know! I will never be able to afford to stay in one, I’m afraid, but it is a dream of mine. I just treat myself to an overpriced café con leche so I can say I’ve been to them when I come across one. I’ve been to several, but never stayed in one. I very much enjoyed the free pilgrim meal at the Santiago Parador. They are offered 3 times a day (breakfast, lunch, dinner) to the first 10 pilgrims to show up for each meal (I don’t have the times written down, but you can stop by the Parador to ask, or check with Pilgrim House..they know for sure). 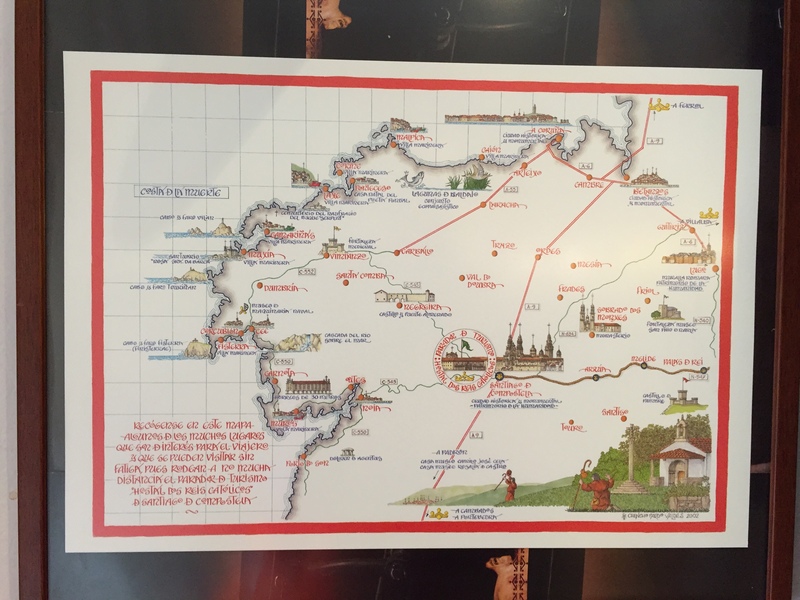 We were instructed to bring our Compostela, to prove that we were pilgrims, but no one ever asked to see mine. 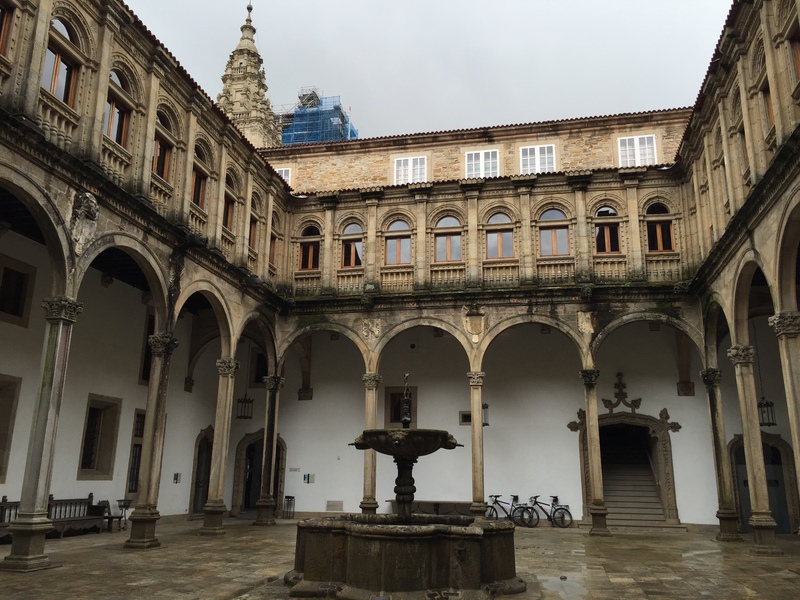 We were ushered through the beautiful courtyards of the Parador (normally off limits if you aren’t staying there), and down into the basement hotel kitchens. Very interesting to see “behind the scenes”. We were given a meal, cafeteria style, that consisted largely of meat, bread and some potatoes…it looked like leftovers to me, but still perfectly acceptable fare. Just don’t expect the fanciness of the upstairs official restaurants. Next we went to a small dining room, which just fit the 10 of us, and left on our own to eat our lunch. Fun people and interesting conversations…as one finds with most groups of pilgrims. Once was enough for me, but I would absolutely recommend this unusual and quintessential pilgrim experience. Thanks for the info! 👏 I took a photo of the Pilgrims Dining room sign in the courtyard and was wondering about it. I will try it next time for sure and take photos for detailed blog post.